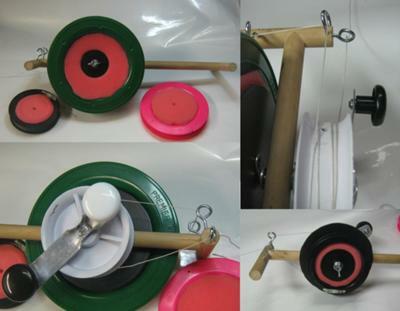 New Style Of Kite Line Winder. I'm working on a new style of kite line winder that I want to share. It uses a capstan to pull the line, and then winds the line onto a lightweight reel. The reel can be quickly dismounted and/or replaced to fly the kite directly from the reel or to wind down another kite. The capstan has two crank handles to handle high and low pull situations, and foam inserts are used to adapt to large and small diameter reels. Normally excess winding tension is a problem that breaks reels. This thing tends to leave little to no tension on the wound line. Very floppy! The main disadvantage of this beast is the line threading from the mounted reel to the capstan. It is do-able, but there are just too many places for the line to get caught at the moment. I'm working on more a detailed article. I just wanted to get this out to where others can take advantage of my summer's development. Comments for New Style Of Kite Line Winder. There are more pictures and a bit of my thought processes on how I put my ideas together. Show Tim how you put your own together!